For use in treating both acute injuries and chronic conditions, deep tissue laser therapy delivers a highly effective alternative to invasive surgery and prescription medications. With patients reporting long-term pain relief, as well as a reduction in frequency and severity of symptoms, laser therapy continues to grow in popularity with more and more functional medicine specialists choosing lasers to treat their patients. Quickly reducing inflammation, deep tissue lasers deliver precise amounts of light therapy to injured or diseased areas. This effect is the result of photons entering the affected tissue and interacting within the mitochondria, which can lead to improved cellular metabolism and a decrease in pain without any adverse side effects. As an innovative alternative to prescription medication and/or invasive surgery, laser therapy treatments can be customized to a patient’s individual needs. Pain-free, soothing and rejuvenating, treatment sessions are often looked forward to by patients in a way similar to massage therapy—in fact, patients often refer to treatments as “laser massages”. 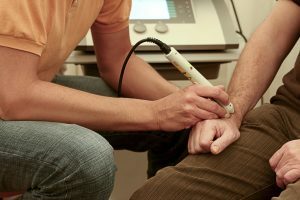 Find out more about deep tissue laser therapy by Springs Integrated Health, and if it’s right for you by scheduling your free consultation today. As Colorado Springs’ premier integrative health provider, we promise professional care with a personal touch.